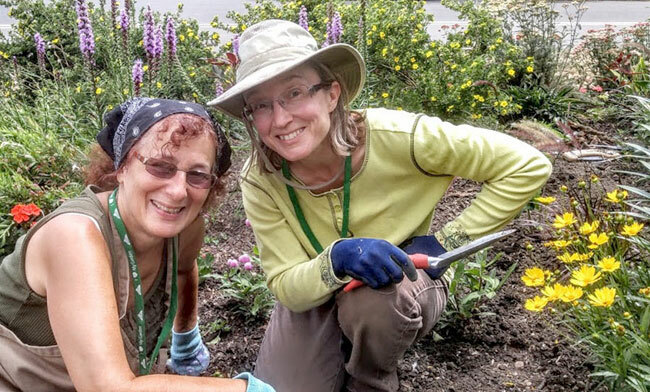 The Buffalo and Erie County Botanical Gardens is recruiting new volunteers to help in a variety of areas including horticulture, facilities, administration, visitor services, weddings, special events and education, as well as serving as docents. Volunteer orientation will be held at the Botanical Gardens from 10 a.m. to 2:30 p.m. Thursday, March 14 at the Botanical Gardens, 2655 South Park Ave., Buffalo. The deadline to register for volunteer orientation is Monday, March 4. Register online or contact Karen Hammer, Program and Volunteer Coordinator at khammer@buffalogardens.com or 716-827-1584, ext. 207. Individuals may choose to train as a horticulture volunteer and work inside and outside the conservatory on many different projects. Horticulture volunteers help create aspects of different exhibits, set up horticulture displays for the entire community to enjoy, re-pot plants from the collection, care for specific areas or plant collections, weed, water and more. Individuals with a handy nature, carpentry or electrical skills, an eye for general maintenance, engineering or construction backgrounds are enthusiastically welcomed. Administrative support volunteers assist the staff with general office work, data entry and more. Visitor services volunteers are considered the Botanical Gardens’ welcome wagon. They are trained to work at the admission desk and in the Gift Shop. Weddings and special events volunteers assist staff with executing very special moments for Botanical Gardens’ clients. Volunteers help welcome guests, arrange décor and enhance personal touches to ensure the event is extraordinary. Docents and education volunteers lead tours, teach hands-on programs and help with field trip programs, Kids Day and Wegmans Family Days. They answer visitor questions during special plant exhibits and assist education staff in programs that inspire visitors of all ages. Internships in horticulture, marketing, development, education and special events are also available all year-round.